The Federal Virtual Worlds Challenge is an open. global challenge to the world to create the best implementations within virtual environments. This year the focus is on artificial intelligence. Historically the U.S. military and sister agencies have expended considerable resources in the development of high-fidelity immersive simulations. With budgets getting tighter it makes sense to leverage low-cost virtual environments to continue to support evolving simulation needs. An opportunity to explore possibilities for using virtual worlds that have not, and may not have ever been considered by the Government. Access to emerging technology that would assist in developing requirements. The ability to explore the global collaboration concept as a research and procurement strategy for future training and analysis needs. Building public awareness regarding Government organizations and the work being conducted in virtual environments. Winners receive a cash prize, travel accommodations to the GameTech Conference in Orlando, FL, and the opportunity to have their entries showcased at the conference. 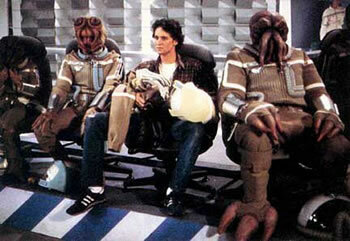 In the 1984 film The Last Starfighter. a software simulation is used to train actual fighters.